The Lewes Historical Society announces the 2019 Mid-Atlantic Sea Glass & Coastal Arts Festival© Saturday, June 22 and Sunday, June 23 at the Cape May Lewes Ferry Terminal at 43 Cape Henlopen Drive in Lewes, Delaware. Hours are 9:00am to 4:00pm on Saturday and 9:00am to 3:00pm on Sunday. Admission to the festival is $5 per person each day, to be paid at the gate ; children under 12 are free. 2019 is the tenth year for this event, and it’s expected to be better than ever! It will feature nearly seventy sea glass artists, joined by other coastal artists- including decoy carvers and waterfowl artists. Vendors come from up and down the East Coast, and as far away as the Virgin Islands. Enjoy festive live music and delicious food all weekend. Learn the history of sea glass and bring your glass shards and bottles, as specialists will be available to identify your treasurers on-site. Like collecting shells, fossils, or stones, combing shorelines for sea glass is a hobby many beachcombers enjoy. Sea Glass hobbyists often fill decorative jars with their collections and take great pleasure in sourcing out a shard's origin. 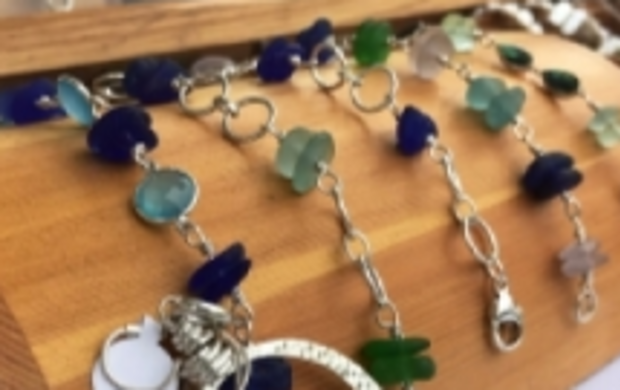 Artisans craft beautiful pieces of jewelry, stained glass and other decorative treasurers from sea glass. Sea glass can be found all over the world, but the beaches of the northeast United States, California, northwest England, Mexico, Hawaii, Puerto Rico, Nova Scotia, Italy and southern Spain are famous for their bounty of sea glass, bottles, bottle lips and stoppers, art glass, marbles, and pottery shards. The best times to look are during spring tides and during the first low tide after a storm. Shards may also evidence a frosted side and a shiny side, most likely because they are pieces broken off from larger glass objects still embedded in mud, silt or clay, which are only slowly being exposed by wave action and erosion. With greater environmental awareness, there has been a decline in naturally occurring sea glass, creating a great market for expensive and rare pieces. The Lewes Historical Society invites the public to celebrate sea glass and coastal art on Saturday, June 22 and Sunday, June 23. For more details about the Mid-Atlantic Sea Glass & Coastal Arts Festival or for more information on The Lewes Historical Society, contact 302-645-7670.